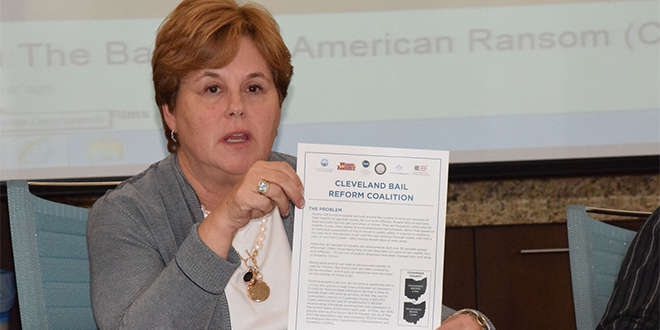 COLUMBUS – About two dozen men and women from Greater Cleveland with diverse backgrounds and faiths boarded a chartered bus last week with one purpose in mind: to advocate for Ohio bail reform. 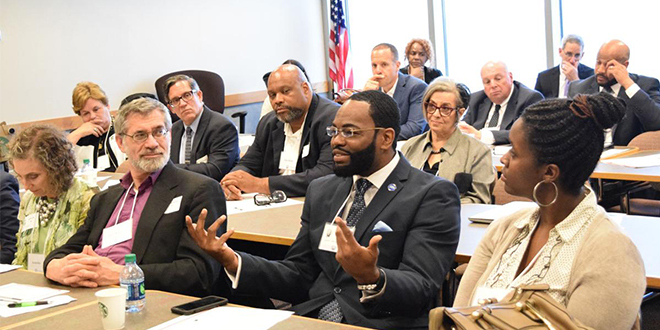 They spent about four hours in front of state officials – explaining their position and stating their case in an attempt to make Ohio House Bill 439 the best it could be – during Cleveland Bail Reform Coalition Columbus Advocacy Day on May 23. One of the participants, Roy Waterman from Queens, N.Y., was making his first trip to the state capital. He was the only non-Clevelander on the bus, but had the most insight into the job that lay ahead. Waterman, in his capacity as criminal justice project manager at the Jewish Council for Public Affairs, joined members of the Jewish Federation of Cleveland, United Black Fund, NAACP, Hispanic Alliance, Towards Employment and Lutheran Metropolitan Ministry to make their voices heard about HB 439, a bail reform bill, which would head to the Ohio Senate if passed in the state House of Representatives. 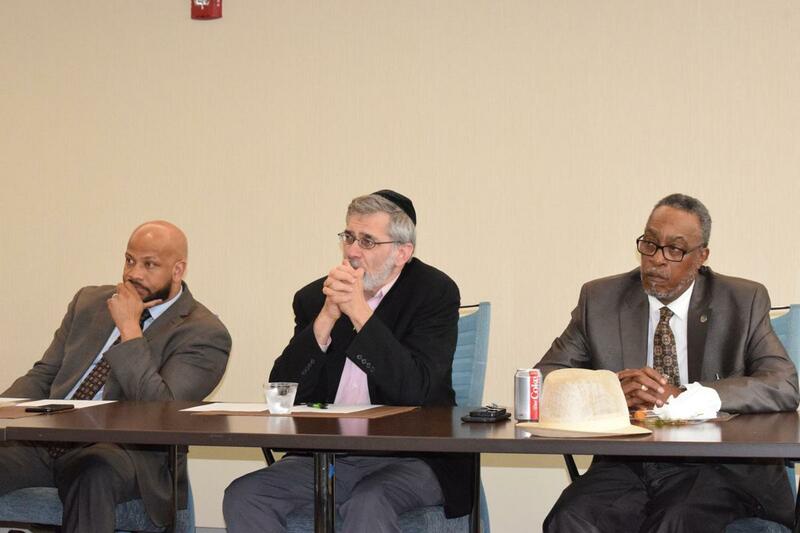 JCPA is the umbrella organization for the Jewish community relations councils and committees and Waterman joined the group to learn more about the local coaltion’s efforts. The Cleveland Jewish News joined them to document their efforts. During the bus ride to Columbus, Waterman opened up to the CJN about many issues he’s confronted in his life. He also spoke about bail reform, mass incarceration, which he calls “institutional racism,” the “money-grabbing” justice system, “antiquated” cash bail reform process, the “enormous” cost to taxpayers, the “desperate” need for change and what he feels is the need for fewer new prisons and more rehabilitation. Waterman has good reason for his keen understanding of the bail and prison systems. He spent more than 12½ years in state and federal prisons in New York and Virginia. Upon his release, he co-founded Drive Change, a social enterprise nonprofit through which he created a food truck business to train, employ and mentor former prisoners. He won an award for best food truck in New York City. This experience led him to want to become a full-time advocate for reform and in early 2018, he joined JCPA, the national hub of the Jewish community relations network based in New York City. He grew up in what he describes as a nice family with both parents working, unlike most in his neighborhood, and an older sister who never was in trouble with the law. At 19, he was arrested for being an accomplice in a murder and for armed bank robbery. During his time in prison, he learned enough about the law to file some appeals. He was successful and was released from prison. In prison, he discovered the power of education and a new purpose for his life. He earned his GED and then took correspondent college classes and became a paralegal. Waterman, now 42 and married, has been one of those imprisoned each day according to the Bureau of Justice Statistics, 2.2 million people are incarcerated each year, with about 34 percent of those being African-Americans. Many are held while awaiting trial, and a large number face only minor charges. HB 439 is a bipartisan bill in the Ohio House of Representatives. No action can be taken on it while a replacement speaker of the house has yet to be appointed following Republican House Speaker Cliff Rosenberger’s mid-April resignation. House rules prohibit the chamber from passing legislation without a speaker. State Reps. Jonathan Dever, R-Madeira, and Tim Ginter, R-Salem, introduced legislation that aims to bring greater fairness and equity to Ohio’s bail system. Currently, bail schedules are exclusively based on offense, and there’s a lack of uniformity across the state. HB 439 would allow courts to impose conditions rather than a set monetary bail and would require courts to use a validated risk-assessment tool – which takes into account a person’s threat to society and the risk a person will fail to appear in court – before establishing bail. Further, it would allow courts to set nonmonetary bail and would require courts to collect certain data on bail, pretrial release and sentencing. The Ohio Criminal Sentencing Commission would be charged with compiling a list of risk assessment tools that would be used to determine proper bail procedures. Fred Bolotin, an attorney with the Cuyahoga County Office of Reentry, said the issue is not just an inner city one. Cecil Lipscomb, executive director of United Black Fund of Greater Cleveland, said lives can be destroyed because of the length of time it takes for someone to reach the bail time frame. Michael Jacobson, vice chair of the Federation’s CRC, said the issue is important for the community. “When somebody is sent to jail for even a week, they generally lose their job after four days,” he said. “There are family issues. A mother has nobody to leave the kids with when she goes to work, and she ends up losing her job. The kids lose a parent, so all these things are very, very important. We learned today that 23 percent of the female population is in jail for drug possession, not drug trafficking, and under the new bail reform, that would become a misdemeanor and there would not be jail – but they would get help. The Ohio Department of Rehabilitation and Correction estimates the prison population today is nearly 50,000 and the prison budget is $1.7 billion. This compares to about 8,300 incarcerated in 1974 and a budget of $264 million. The coalition estimates it costs $25,000 per year for each person incarcerated in Cuyahoga County, while rehabilitation costs are $8,000 per year. U.S. taxpayers spend $13.6 billion on incarcerated people awaiting trial. The bus departed from the Federation’s Jack, Joseph and Morton Mandel Building in Beachwood, and after clearing security at the Verb Riffe State Office Tower in downtown Columbus, the group spent the next five hours – save for a brief tour of Ohio Holocaust Liberators Memorial on Capitol Square with guide Steve Edelstein of the Jewish Federation of Columbus, learning about the state of incarceration and bail reform in Ohio and advocating for changes to HR439 to legislators. Among those the coalition met with were Gary Mohr, director of the Ohio Department of Rehabilitation and Corrections; Nick Celebrezze, D-Parma, house ranking minority member; Senate chair John Eklund, R-Munson Township; Senate President Pro Tempore Bob Peterson, R-Washington Court House; and Dever and Ginter. The officials briefed the coalition, answered questions and heard prepared remarks from Renny Wolfson, past chair of the Federation’s CRC and JCPA board member; Robert Kirschner of Lutheran Metropolitan Ministries; and Bishara Addison of Towards Employment, a workforce development organization that serves a population where about 60 percent of those it attempt to help have criminal records, she said. The Federation looked for an issue to wrap its arms around last December, and a few months later, the coalition began to take shape. A two-hour meeting was held May 22, attended by many of the 25 who traveled to Columbus as well as others who couldn’t make the advocacy trip. They got to know each other, learned about HB 439, discussed strategy and heard Waterman share his story. “We had the right representatives that were very well-versed on the issues related to bail reform and this issue in particular,” said Brad Schlang, chair of the Federation’s CRC. 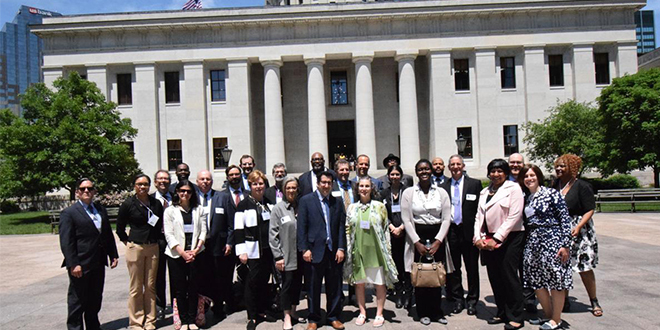 “We had the right participants on the trip, and for me, the key message was the Jewish community, the Latino community and the African-American community joining together to come to Columbus to advocate on an issue that’s critical to all of Greater Cleveland. Lipscomb participated in a trip to Israel with the Federation last year and views this coalition as an extension of that partnership. “For me, this is a continuation of the relationship I established with them,” he said. “To be able to come to Columbus with a unified voice that crosses many sections of our community, it is very powerful. It shows that it’s the issues that drive, it’s the humanity that drives the commonality between us. There are very few differences when it boils down to it. Having the Jewish communities support on this issue is invaluable, said Waterman, who admitted to having little contact with Jewish people until accepting his role with the JCPA. “The Jewish community, when they came to this country, they were ostracized, they were dehumanized, they were called names and had to use separate bathrooms, so they know what it’s like personally to feel dehumanized. And us, just based off of our history of oppression in this country, there’s so much commonality, there’s so many ways there is intersectionality and identifying slavery and morphing it into mass incarceration and the trauma that’s associated with slavery. Klein said, “Today has been really successful. We had the opportunity to show that we are a strong coalition from Cleveland, that we’re a diverse group, that we care about the issue of bail reform very deeply and we’re committed to seeing it through. The coalition left Beachwood under cloudy skies and a few raindrops and returned to the Federation building under bright, sunny skies. As the Cleveland contingency walked off the bus, they did so with a renewed sense of optimism that they will likely make a difference in bail reform in Ohio.